Today, shifting documents from employee to employee by email attachment is considered "so 90s." No wonder: Office suites enable completely new forms of cooperative work, often via cloud or on-site servers. This article takes a look at the rather confusing market that has developed around collaborative office suites. There is no uniform approach to what collaborative work looks like. Different methods reflect different visions of the modern work environment. However, one important distinction is between a client/server-based collaborative working environment and web-based collaboration. Client/server structures store all data processed by a team on a server. A client application uses the Message Application Programming Interface  to allow simultaneous use of the data. Typical applications include diary, address management, and project management software. The other approach to collaborative software involves web-based solutions storing data and software packages centrally on a self-managed server. Users access the service via a web browser. On the upside, this concept offers lower administrative overhead: You do not have to install and maintain any applications on the workstations, and a web browser is standard on modern computer systems. The installation's potentially inferior reliability is the downside: If the server fails, the whole system ceases to function. In addition, there are also purely cloud-based programs in which both the applications and the data storage reside in the cloud. The advantage: Installing servers on site often proves to be complicated and error-prone. Users leverage cloud as Software as a Service (SaaS)  to avoid the need to install a server variant onsite – operators completely manage the services centrally. When it comes to editing texts, tables, and presentations, groupware-capable solutions do not yet play as important a role as in traditional collaborative tasks: Project management, PIM, or CRM systems have been focusing on cooperation for some time now – they no longer exist as single-user versions. Numerous Linux providers lag behind in terms of office teamwork solutions. They deliver office suites that are suitable for use in workgroups. However, there is a sticking point: If users work in environments with a range of operating systems, they need to easily exchange files without any problems; they don't want to worry about converting between file formats. 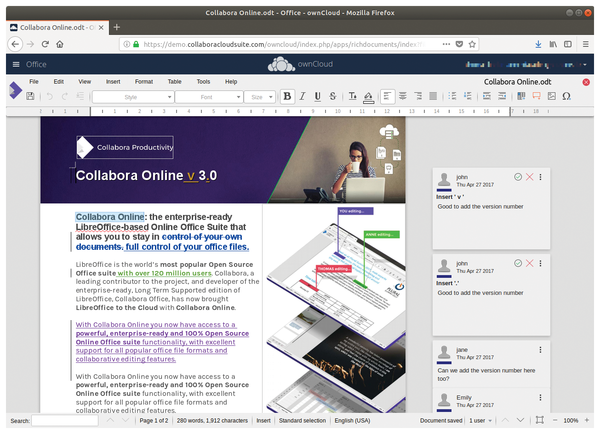 Collabora Online (Figure 1) might be familiar to users: The Collabora Office  enterprise desktop solution from the United Kingdom is a customized LibreOffice that has been modified to work in the cloud on a server. Figure 1: Collabora Online is a functionally streamlined LibreOffice with teamwork components. Collabora Online benefits from long-term support and is available across platforms. The manufacturer provides commercial support services via various service partners worldwide. Beyond this, Collabora Online Development Edition (CODE) is another web-based teamwork solution derived from Collabora Office core. Ultimately, both variants allow users to create and edit documents on web browser clients. This works without requiring users to install the office suite locally on their desktop systems. However, in contrast to Collabora Online, CODE is rather experimental in character. The company, therefore, does not recommend it for production use. It is available as a Docker image for use in the home office and is more likely to be used for testing purposes . If you want to use the two packages, you need an ownCloud, Nextcloud, Pydio, or Seafile infrastructure as a prerequisite. As a third package, the company distributes the Collabora CloudSuite (see  for a demo). CloudSuite is a combination of an online and a desktop editor. It includes a local installation of Collabora Office as well as the cloud variant. The result is that CloudSuite makes documents available at the workplace and simultaneously pushes them onto smartphones or tablets.